Increase the range of your Wii sensor bar. I got this email from a friend, Drew regarding Wii hacks. I may give this a try this weekend. If I get a chance, I’ll grab pictures as I go and post a step by step. Each Monday morning, I’ll share with you what’s rolling through the weekend remnants of my Google Reader subscriptions. From TV, to sports, to tech…I’ve got alot of random feeds that point me in different directions to start the week. David Churbuck references an article from Forbes.com that talks about marketing during a recession. 5. Shift media spending to accountable media. Not because they necessarily perform better, but because investment in them can be justified in terms of return on investment. A heavy bias toward accountable spending is the best way to protect marketing budgets from profit-starved CFOs. David points to a likely rise in email and search marketing as they are the pinnacle of accountability. But I still wonder, is that the short sighted? I understand the attraction to the items that are likely to push out positive ROI metrics, but does that mean they are truly accountable? What is the opportunity cost against plucking off the bottom of the funnel? Would those customers have reached you anyway? I constantly struggle with the balance of proving your marketing spend by marketing in the places that you know will return a positive metric vs. marketing in the place that will have the most impact on your short/mid/long term bottom line. Search is fairly bullet proof at this point. But having to pony up money to buy branded search terms where a large percentage of ROI comes from just to push people down the funnel in a direction they would have likely taken anyway still irks me. But I understand it. Email marketing however, I don’t neccessarily find effective. It’s direct response, and managing campaigns against your installed base of customers is a must. But prospecting using 3rd party or rental lists is a tactic I just don’t get. Brock for Broglio lists the 101 best fantasy baseball team names. I may have to revert back to “The Wright Stuff” or branch out to “Pap.licio.us” this season. I still love the name the “Funky Cold Mussinas”. Just brilliant. CelticsBlog reacts to the Celtics recent 5-5 stretch with a blueprint for slowing down the C’s. Hot shooting seems to be the #1 culprit to at least 3 of the recent 5 Celtics’ losses. That shot yesterday by Turkolou was incredible. John Battelle shows us a fun Google trick. Ever try and find information about Chuck Norris? One more thing that boggled my mind this morning before I start doing peer reviews; check out this article from News.com on the Wii hacking of Johnny Chung Lee. I doubt I can do this justice and need to think more on the topic before expounding on my own. But watch this to get a feel for the awesomeness. 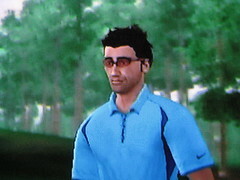 Here’s a picture of my digital self on the golf course. Good posture, good address. 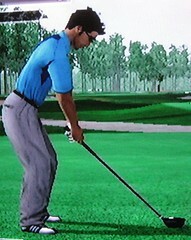 Hey, I’ve got a pretty good swing. I only spent two hours fine tuning the details to represent me as much as possible.